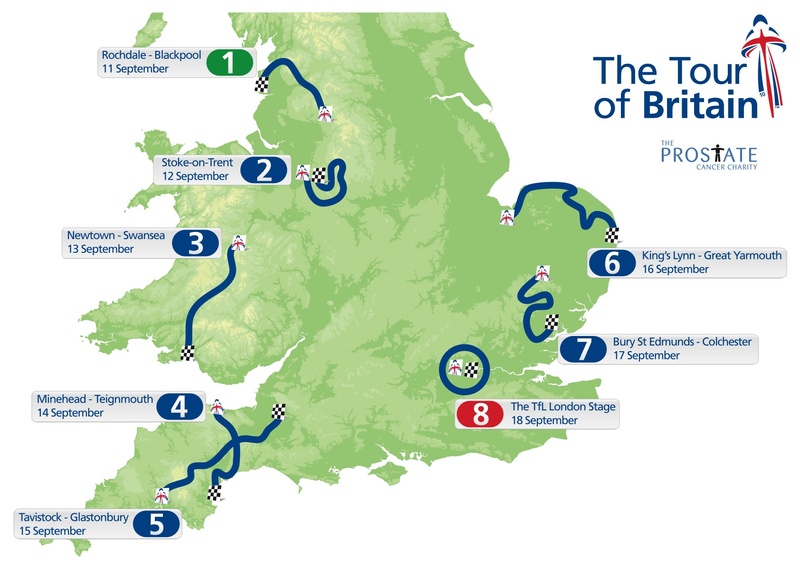 The route for the 2010 Tour of Britain has been unveiled by the organisers. The eight-day race will start in Rochdale in Lancashire on Saturday, September 11 and visit Wales, the south west, East Anglia and Essex before finishing with a circuit race in east London. Because of a clash with the Pope’s visit to London, the centre of the city is out of bounds to the race on the orders of the police and security services. Instead, the final stage will be a criterium in the London borough of Newham, passing the docks and London City airport. This will be the seventh edition of the race since its revival in 2004. The rolling opening stage will head north from Rochdale, into the Forest of Bowland before turning to finish on the seafront in Blackpool. Stoke-on-Trent hosts the start and finish of stage two with the race heading into Staffordshire and the edge of the Peak District. After a transfer to mid-Wales, stage three runs from Newtown to Swansea, crossing the Black Mountains on the way. Approaching the stage finish, the field will climb the steep cobbled brute of Constitution Hill where many riders have been forced to walk in past incarnations of the race. There are two tough days in the West Country which have the capacity to decide the race. The first, stage four, goes from coast to cost, starting in Minehead in Somerset and finishing in Teignmouth, Devon. It’s one of those days where the roads will be up or down, rarely flat. Stage five starts in Tavistock and crosses the heart of Dartmoor to finish in Glastonbury, Somerset. And then the riders face an transfer of epic proportions because stage six starts 245 miles away, in King’s Lynn in Norfolk, East Anglia. The Tour of Britain has often been criticised for the length of its transfers, an often unavoidable result of how the event is funded, by regional development agencies. But even with a clear run, this journey will take more than four-and-a-half hours by road, placing strain on the riders and support staff. Presumably the organisers will split the journey and do part of the transfer after the stage and the rest the following morning before the race. However, the transfer does mean the race can visit East Anglia for the first time and stage six, which hugs the Norfolk coastline before darting inland and finally finishing at Great Yarmouth, will be flat and fast. There’s another flat stage from Bury St Edmunds to Colchester in Essex, a town that hosted a Tour Series event last year, before the final stage in London’s Docklands. There may not be as many historic landmarks, but this is a stone’s throw from the part of London that will play host to the Olympics in two years time.